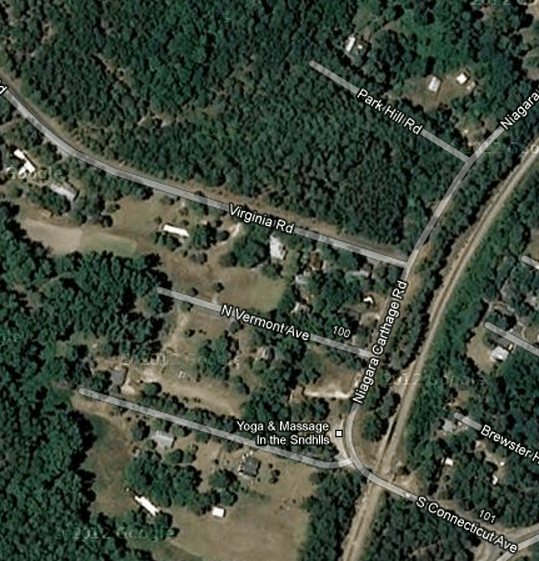 Perhaps varying in rate but seemingly unending is the migration of northerners to The Old North State, a process that led to the development of Pinehurst and Southern Pines in the late 19th century, and the population explosion in the late 20th century of the town of Cary (resulting in the acronym CARY = Containment Area for Relocated Yankees). Not all the land speculation schemes resulted in great success. An example of one that did not is Niagara, North Carolina. The town of Niagara was a planned development by the New England and Southern Improvement Company of Boston, Massachusetts. (Yes, that company name irritates me). 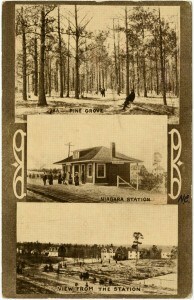 A promotional pamphlet was printed circa 1902: Niagara, Moore County, North Carolina; The land of pines, sunshine, birds and flowers. Likely published simultaneously was the following map of the developing community. 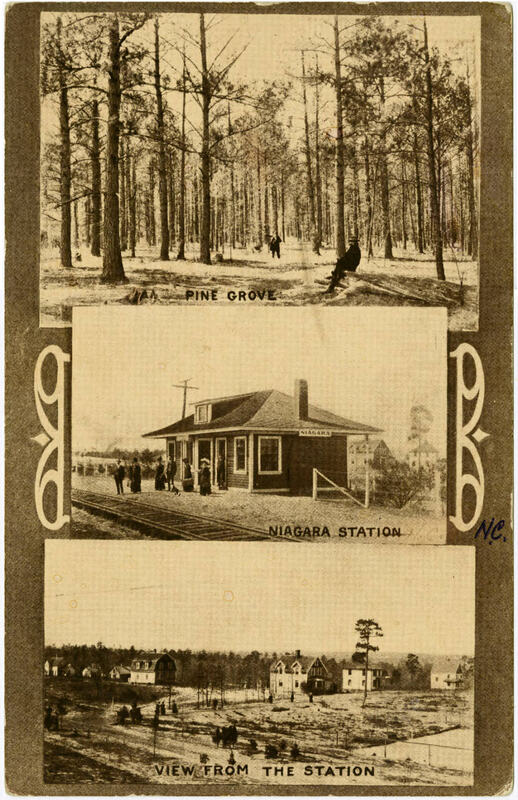 Given the unflattering photographs at the top of the map, it is no wonder that Niagara never achieved a permanent place on the map like its older Sandhills sisters. However, there was some initial success, including the establishment of the Webster Library in 1912. (For a fascinating discussion of the Webster Library, please refer to pages 342-347 of Ronald E. Bergquist’s 2006 PhD dissertation, available on line here.) 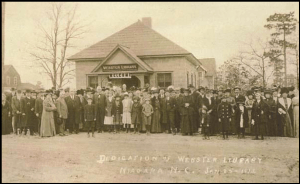 The following image of the Webster Library’s dedication in January 1912, is courtesy of the Moore County Historical Association‘s Facebook photo album. 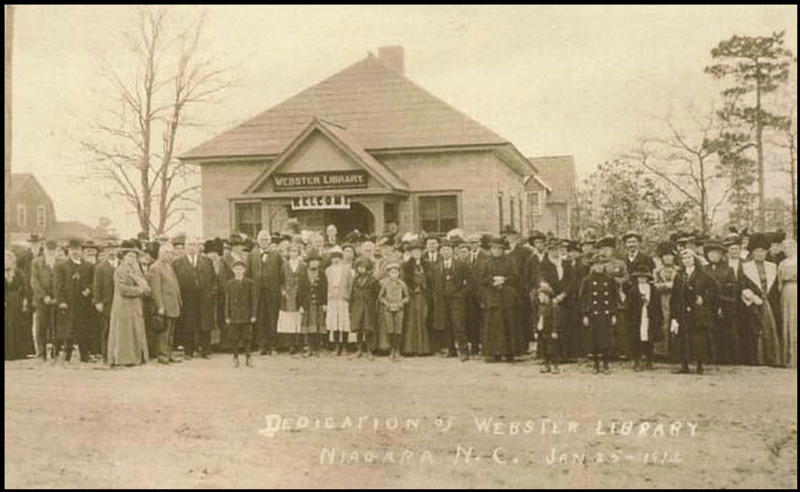 The Webster Library also served as office for the Niagara Water Company for many years. HEALTH, STRENGTH, AND A LIVING. Long Leaf Pine belt of North Carolina. such places, access to market is easy. the paraphernalia will be in operation. most advanced system known to science. regaining lost health and strength. bination of water and land travel. in value many times in a very few years. 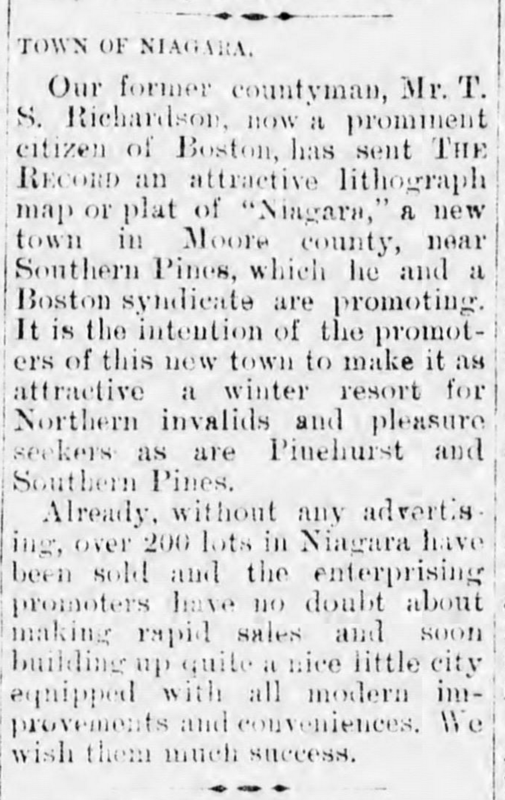 they were for Southern Pines then. N.C. J. B. L. Bartlett, treasurer. To read more about the rise and fall of Niagara, NC, check your local library for Patsy Tucker’s article, “Niagara Never Quite Made It”, which appeared in the August 1978 issue of The State magazine (Vol. 46 Issue 3, p18-19, 28, il). The author concludes: Today Niagara is a quiet place off of the main highway…much the way it was before the land schemers came in. A nice place to live. UPDATE: As of January 2015, the above article is now accessible on line here! If you have comments or memories about Niagara, NC, please share them with us via “Leave a Reply” below. 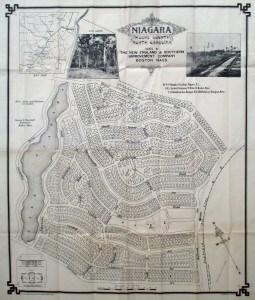 This entry was posted in 20th Century and beyond, Town Plans and tagged New England and Southern Improvement Company, Niagara NC, Real Estate Development, Sandhills, Webster Library by crmaps. Bookmark the permalink. Great news! Our State magazine has been digitized. 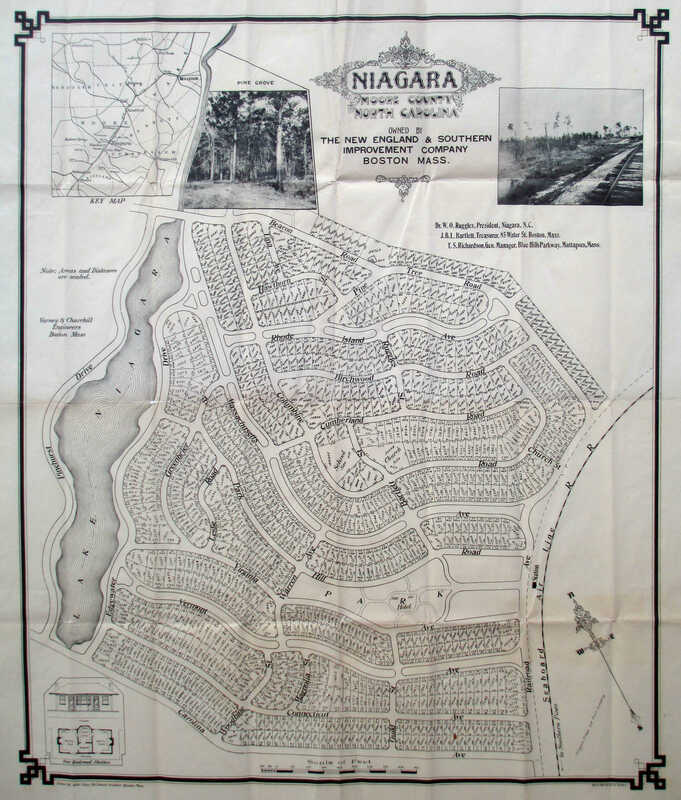 Here is a link to the 1978 article about the town of Niagara (also added to the post above). The entire digitized library of Our State can be found via this link. Congratulations and thank you to all those involved in making Our State a part of the North Carolina Digital Collections. T. S. Richardson (Thomas Sidney) was my 2x great uncle and one of the developers of this project. I just found him after so many years of researching so I want to thank you for having this site posted and a way to make him even more real to me and his descendants! Thank you so much for your kind comments and for sending me the information about the article in The Chatham Record, which I’ve added to the post above. I found other articles about the Niagara grape crops from Moore County. Those articles predate the founding of the town by at least 10 years. It’s quite possible that the town received its name from the presence of the Niagara grape vineyards in the region.